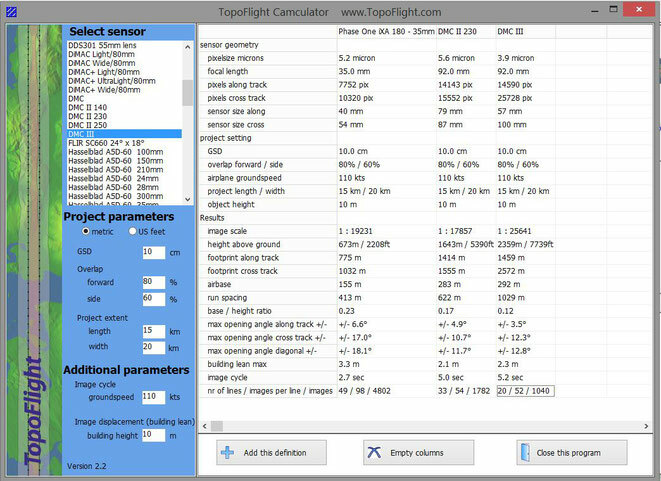 TopoFlight Camculator is a free tool to efficiently compare different cameras against each other. In today’s market, there are many sensors available. Our software shows the characteristics of each sensor for a project with selectable parameters (like project extent and GSD). In ccoperation with GGS Speyer and PhaseOne we have integrated an oblique camera system. It consist of one vertical and four 45° oblique looking cameras using the newest iXM series of PhaseOne.